We're involved in an agricultural system that's bleeding the world dry. Our topsoil is continuously eroding, destroying our ability to grow food; chemicals are ruining our health , our world, and everything in it; rampant industrial meat production is causing the rain forests of South America to be cut down; and shipping almost all of our food in from afar is yet a huge drain on energy and a source of pollution. For more details on the problems associated with modern farming practices and an examination of superior agricultural systems, read this article. The situation is not hopeless, and we don't need to rely on corporate-run farms to set things aright. Just look at what a couple of guys in the middle of the desert can accomplish. Buying as much organic produce as you can afford is a great thing to do, but it's expensive, and not necessarily grown under ideal conditions. 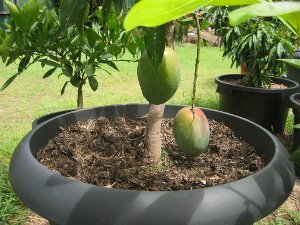 Growing organic food at home in any spot available- whether that's a three-acre suburban plot in South Florida that can produce all the food your family needs year round, or the balcony attached to a London flat that can grow all your salad greens during the warmer months- is a huge money, health and earth saving contribution. You'll escape the pesticides that have been shown to be harmful to humans, and also boost your intake of vitamin B12, which is more heavily present in organic soils. If you've never gardened, the idea of growing organic food, with its attendant topics of compost, fertilizers, pest control, or even just how much sun and water your food needs, can be daunting. But starting with something simple, like a pot filled with organic potting soil growing a tomato plant, is a great way to begin. As you succeed, you'll want to keep expanding your organic gardening activities. You can plant a tree in a half hour, but that tree can produce enough fruit to put a serious dent in your food needs. A half acre of apple trees can yield enough fruit to provide about 115 apples, or 12,677 calories per day (1), which is probably enough to feed four average people. Pick more calorically dense fruit and you'll do even better. Give yourself a mix of different trees that ripen at different times and enjoy the delicious surplus. Best of all, fruit trees don't need anywhere near the level of attention that most annual vegetables need. Being creative will increase your options. If you don't have a yard, you can stick a dwarf fruit tree in deep pot and place it on a sunny balcony. 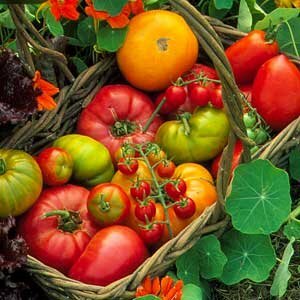 You'll probably be surprised at how many tomatoes you can grow out of buckets and other odd containers . Not only will you produce lots of chemical-free food that's healthier for you and the world, but you'll save a lot of money too. What if you could shave off 50 percent of your food bill for half the year? Ambitious gardeners eating a healthy fruit-centered diet sometimes grow over 90 percent of their produce in warm areas. It's not too hard when you plant a diverse group of fruit trees and a great vegetable garden. Imagine the financial repercussions this would have in your life. Suddenly survival doesn't depend quite so much on the 9 to 5 job. 1) Why you should consider a raised bed garden. Read about adopting a healthy raw food diet that can heal you and the earth here. Learn how edible landscape design can turn your yard into an fruit oasis which will feed you and your family. Dream about some great recipes while growing organic food. 1) Apples & More, "Apple facts," University of Illinois .One tree produces an average of 20 bushels. One bushel contains about 120 apples.